Region: This weevil can be found throughout North America. Life cycle: This insect produces one generation each year when found existing outside, but when they infest stored beans, they will breed continuously. The outdoor variety hibernate under garden rubbish. Physical Description: This flat, 1/10 to 1/5 inch long weevil is dark green or brown with a darker mottling, and the legs and antennae are reddish. 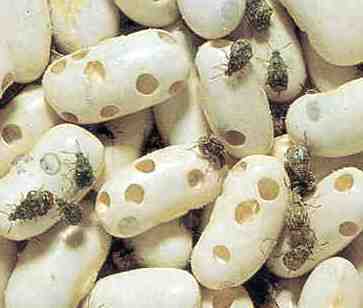 The weevil lays white eggs in holes chewed along the bean pod seam. The grubs are small, fat, and white. Feeding characteristics: This pest attacks bean and pea plants by hatching grubs that feed within the bean or pea seed and then exit through small holes. Controls: The beans can be cured after harvest by uprooting the plants with the pods and suspending them off the ground. The curing process takes at least six weeks that includes several biological changes including fermentation and the production of heat. The cured beans can now be shelled and stored in a dry environment without the danger of weevil damage. For stored beans, protect them by heating them up to 135 degrees for a period of three to four hours, or suspend them in a bag of water, heat to 140 degrees and then rapidly dry.